Creative expression, regardless of what subject you teach, is in my view a great way to have students make abstract connections to the concrete skills that they are learning. When I taught math there was always a place for students to create digital stories of the concepts that they were learning. I usually made this lesson a tent pole lesson, which were my lessons that happened in the middle of the unit. I found that these stories often painted a very clear picture of whether or not there was any learning happening. They become an important piece of my assessment puzzle. There are so many tools and different ways to have students work with digital storytelling now that it can be hard at times to seperate the good from the not so good. I generally recommend that the tool should not get in the way of the outcome, which in this case would be a story. The tool should be easy enough to use that any age, or ability level, can do so. One such tool that I have had success with using is Google’s Cultural Institute. Really? Google Has Cultural Institute? Google’s Cultural Institute combines the efforts of the Art Project, World Wonders and Historic Moments. It’s full of really high resolution photographs that allow you, on some art, to zoom all the way into the brush stroke. You can use the CI to do a virtual field trip of some of the best museums in the world by clicking on the Museum View dude (Streetview dude in Google Maps). My favorite Museum View is the White House. It actually gives you the feel of walking through the actual White House and looking at all of the amazing works of art that they have. A newer feature of the CI is the ability to combine your saved artworks into your very own gallery. You can add text (200 characters, slightly more than a tweet), or link to a YouTube video. The CI also allows you to make your gallery open to the public. Because there is so much contained here the possibilities are quite endless on how you can use the CI with students. Since the CI is a Google product you have the ability to search. 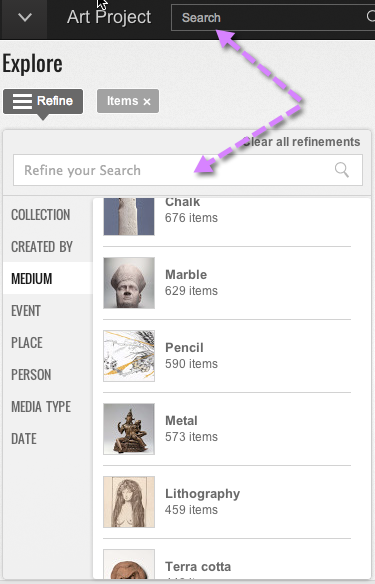 If you are looking for specific types of art, explore the artworks and search for what you are looking by medium. When you do this you begin to see just how much they have in their collection and how powerful of a learning tool this is for students. My 4-year old son is very curious about art. Together we have been exploring some of the galleries looking for pieces that interest him. We began saving the blue pieces and then placed his favorite ones into a gallery. I asked him why he liked these pieces and he said that they made him feel happy. With my help we typed up one sentence stories and created Blue Happiness which we have made public. When I taught math I would have my students write their own stories. It was a way for them to express themsevles and for me to assess whether any learning was transfering. With the CI students have a very easy tool, access to amazing photos and artwork to work with as they write their own math stories. If 200 characters is not enough space you can use the text box to paste a link from a shared Google Document or use YouTube to record a selfie-narration. My favorite project with my geometry students was to look at art and then identify various geometric concepts happening within the art. With the CI I can now incorporate Google Draw into the lesson. Have students identify geometric concepts that they are learning from the pieces of art and then use Google Draw to explain those concepts back. Instead of text just paste the link to the drawing so that those viewing the gallery can see the visual explanation. When learning about new cultures, or countries, why not have students use the CI to identify artifacts and create an adventure story with them. For more than 200 characters link a Google Doc to each of the visuals. For more advanced students have them create a “choose your own adventure” story that links together several different galleries that the reader can move through. Use the various types of art to create artifacts that the reader chooses locations to search. Have the students research the artifact and include some interesting facts about it, where it came from and who made it right in the story. How a picture is framed, captioned, and distributed can blunt, heighten, or pervert its effect. Are we being informed, or manipulated? Reassure or enraged? The Historic Moments section of the CI is filled with many histroic photographs. It is like looking back at the past through the lens of those that experienced it. Have students create a gallery that answers the questions above. If you are studying about a war you can also have students answer if war is horiffic, or a heroic adventure. Have them play with the captions to change the effect of the photo. What Does Art Say About the Culture? Instead of just reading about a culture, or country that the students are learning about, have them explore its art. Here’s a gallery of early 20th century art from Japan. What do the images, colors and artifacts tell us about them? Have students locate art from the country or culture they are learning about and create a gallery that connects the concrete with the abstract. You could spend days exploring the CI and all that it has to offer. I encourage you to do so. Play. Zoom. Save. Create. Reflect. Write. Have fun! It always starts with a question. Most of the time there is a simple answer to that question. How do I get to that city from here? What was the name of that actress that played in that movie? But a lot of times our questions don’t have an easy answer to them. That is an answer that can be found within one, or two searches. For these answers to our more complex questions we need to know how to search, or what most call research. But research is really nothing more than asking a question that requires the person, or persons who are asking the question to search for an answer (Jonassen, 2011). And what usually happens, is that one question leads to another. The goal is to collect as much data to draw and then support a logical conclusion, or answer, to your question(s) (Jonassen, 2011). Supports knowledge construction for both representing learner’s ideas, understandings and beliefs as well as for producing organized, multimedia knowledge bases by the learner. Is a vehicle that supports the exploration of knowledge by supporting and constructing information to compare perspectives, beliefs, and worldviews. (Jonassen, 2011). Searching for Information requires the learner to acquire multiple skills. Effective information gathering from the Internet combines expertise in searching for information and also assessing the worth of that information in order to organize it into something that is usable (Jonassen, 2011). Therefore, finding information on the Internet can be extremely challenging to students because of how much information is available. Teaching students how to research for that information supports their exploration of knowledge and allows them to compare and contrast various perspectives, beliefs and worldviews on that information (Jonassen, 2011). How do people enter items into a search engine query box? How do they interpret those results? Therefore this lesson on teaching students how to conduct inquiry-driven research addresses those questions and also seeks to educate the learners on how search engines work. The goal is to increase the learners search engine literacy by advancing not only their searching skills, but also by educating them on how to compare the information that they are receiving through triangulation (Halavais, 2013; Jonassen, 2011). Who is more popular, Justin Bieber, Miley Cyrus, or Beyoncé? I love questions like this. You can’t just Google the question to find the answer to it. Believe it or not but this is a question that will require deep inquiry and research. Yes, we’re going to Google it. But we’re going to Google it in a way that teaches students how to conduct inquiry-driven research in which they will collect data that they will then use to draw and support a conclusion from. Let Us Look at the Trends? Popularity can be so subjective on its surface. However we can look a little deeper and agree that the more popular something, or someone in our case, is the more that people will be searching for it. And we can all agree that the place most people search for something is in a search engine. And the most popular and widely used search engine is Google. Using Google Trends we can examine how people from all over the world are searching. With Trends we will be able to see how often a particular search-term is entered that is relative to the total search-volume across various regions of the world and in various languages. Trends is like having your finger on the pulse of the world. Our interest in the popularity of Miley Cyrus, Justin Bieber and Beyonce can be easily looked at in Trends. A graph is returned charting the amount of searching of the three over the last ten years. Below the graph is where you can see the regional interest of each of them. This is important since it is also important to teach our students more of a global perspective on the topics that they are searching for. The graph is interactive, so as you mouse-over it you are given a month-by-month account of each of the three artists’ search-volume. It gets particularly interesting in April 2008 when Miley Cyrus’ graph spikes for the first time. The graph doesn’t tell you why, it just gives you a date. This gives students the chance to figure it out on their own. It’s a digital puzzle that they get to put together themselves. What happened in April 2008 that caused her to jump in searches, or in February 2011 when Justin Bieber spiked to 100? That’s the students job to piece it all together. After having the students look at their question through the Google Trends lens we are left with more questions than answers. Why did Justin Bieber spike? What happened in the summer of 2013 to make Miley’s search go through the roof? Why did Beyonce’s global interest begin to grow in the first half of 2008? I haven’t answered the first question yet, remember, the who is more popular one? What I’ve done is added even more questions to my original question. Our inquiry is only beginning. It’s time that we introduce a Google Spreadsheet to the fun. We need a place to organize our data. On our Gsheet I have created a tab for each of the 3 artists. The students will work collaboratively to identify and collect the dates of a significant trend. That is when an artist sees an increase, or decrease, in searches. If an artist sees a rise in searches from the previous month we will color code the column green. If they see a decrease we will use red. This will give students an easier way to visualize their data. Once they have compiled their data in their GSheet it will be time to begin piecing the puzzle together. Since this project has more to do with pop culture it might be best to use a credible newspaper, or magazine as our primary source of information. Students will use advanced searching techniques in Google to search for this information from credible sources only. They will use their GSheet to log the data that they research and provide a link back to the credible source. As credible sources for this inquiry we will use the Los Angeles Times (LATimes.com) and the New York Times (NYTimes.com). We will use a Google Site Advanced Search to search for our data on only those two specific sites. Since we want to find credible data and then corroborate that data with another credible source we may need to use a 3rd site just incase we can’t corroborate our data between the LA and NY Times. Once the students have identified some data to search for they will use Google to search only the LA and NY Times. To accomplish this they use an advanced search function know as a Site search. Type – Justin Bieber site:latimes.com – into the Google search box. Once the results load use the Search Tools to search by a specific date range. This will return all mentions of Justin Bieber from the month of November, 2009, the first month that he begins to see an increase in his search-volume. In the results that are returned we learn that the Bieber’s appearance at a Long Island, New York mall caused a near riot and led to the police arresting somebody. Could this be the first moment where Bieber-mania was born? Remember when I said that we may need a third site to search? Well in May, 2010 the Bieber sees a huge spike in his search-volume when he reaches 91. Searching both the LA and NY Times didn’t return any significant reason. I selected YouTube as my third site. YouTube is the 2nd most used search engine behind Google. When I searched YouTube with the string Justin Bieber in May 2010 I am greeted with the reason why we saw his spike. The Bieber was making the rounds on all of the major talk shows, including Oprah, Ellen and American Idol. The Bieber has hit the big times. While the topic we are researching isn’t scholarly, the methods that we are using are. This example that I am using was designed more for the upper/high school level student. But there are plenty of ways to modify it so that even our youngest students can begin to understand how searching works. The World’s Favorite Color? – A great way to get our young students thinking about search and the world in which they live. This is also an amazing way to introduce graphs to our young learners. Teachers using this activity can ask inquiry-driven questions like what is the most popular searched for color and why might that be? Why is red so popular in the United States, and Green so popular in China? I don’t have the answer to these questions. But I can think of some advanced searches that I would use to begin finding out with my students. And for students learning how to write, why not use a Google Document to have them make predictions and write down their answers after you’ve taken them through a few advanced searches. The World’s Most Popular Form of Government – Here’s a way to get students thinking globally about more than just one form of government. Inquiry-driven questions to begin asking are; why is socialism so popular in Cuba? Why isn’t democracy a widely searched term in the United States, but is in Bhutan? What happened in November, 2008 when democracy spiked to 100 and become more popular than socialism in searches for the first time? These inquiry-driven questions can also be great jumping off points into students conducting research into various countries and dates in modern history. There is a lot to sink your teeth into here and you can literally spend hours playing in Google Trends comparing different search terms with each other and checking to see what is trending in other countries. This is why learning how to search is so important to learn and thus teach to our students. It’s kind of exciting, and a little scary, to think about just how much we can begin to learn just by seeing what people are searching for. And if you thought that the Bieber, Beyonce and Cyrus example wasn’t very academic then I invite you to consider this. As you have students look over their data and compare the dates of search-volume spikes to the data they collect on what happened on those dates a very clear picture will begin to form. That picture will teach your students more about digital leadership, and responsibility than any canned lesson that is contained on one of those websites that is dedicated to the topic. The reason, the students use inquiry-driven research to piece together a very clear puzzle that they are able to draw their own conclusions from. That’s powerful learning through powerful researching that just can’t be done by watching a video. I invite you to see if you and your students can put that puzzle together for themselves. Halavais, Alexander. Search engine society. John Wiley & Sons, 2013. Jonassen, David H. Meaningful learning with technology. Pearson/Merrill Prentice Hall, 2011.